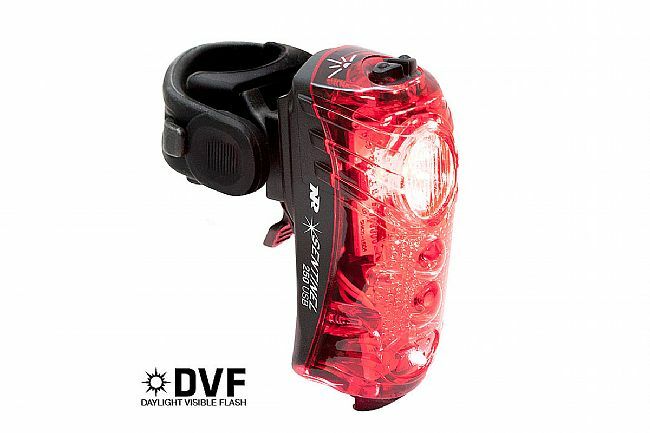 NiteRider's Sentinel 250 Rear Light is designed to increase cycling safety with two varying flash patterns, two steady beams, and three laser lane modes. Two powerful LEDs, behind a durable red lens and casing, emit 250 lumens in the brightest setting, ensuring you're seen whether it's day or night. When more visibility is desired, switch to one of the Laser Lane modes which project ultra-bright laser lines on the ground, creating a highly visible virtual lane for the rider. 7 modes - flashing and steady, with and without lasers. Compliant with FDA standard for lasers, notice No. 50, 2007. Meets FL1 Standard IP64; dust and water-resistant. Easy on / off seat post strap mount with quick release tab. I look behind me and see the red blinking flash on stop signs blocks away. I ride on the street 100% of the time. At night or on gray days the light decreases the likelihood of getting rear-ended. Drivers will see you and that is a neccesity while being on the road. I love the different options that the product offers. I am seen very well.